Just when I think I know almost everything about gardening in Manhattan, I find out I don't. 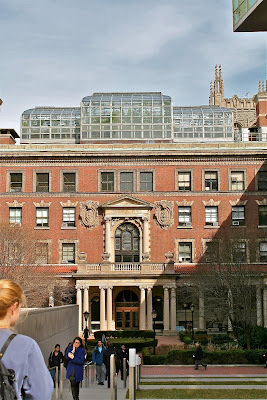 On the roof of Milbank Hall, at the northern end of the Barnard College campus, 116th & Broadway, sits the Arthur Ross Greenhouse. 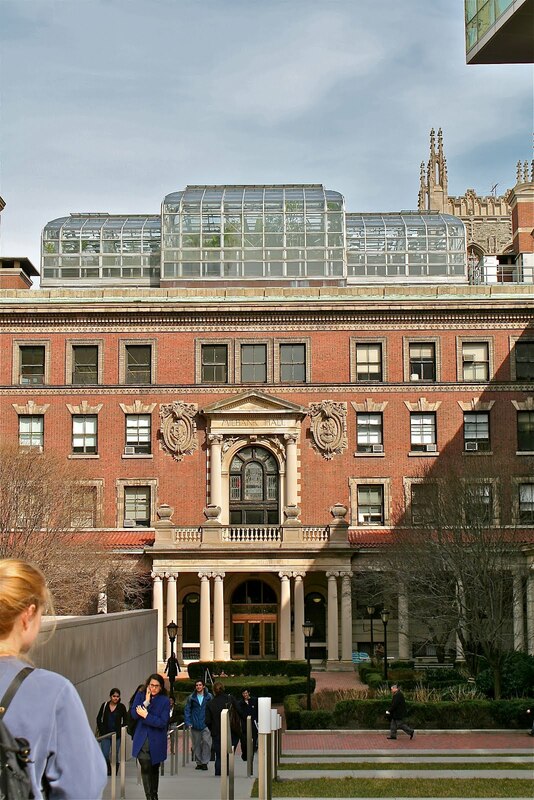 It was built for students and teachers in the Biology department, for research and demonstration. AND it's open to the public free of charge on Wednesday afternoons from 1-3pm. If you go, you'll get an informative guided tour from either the greenhouse coordinator Krystyna Bucharowski, or one of her student assistants. 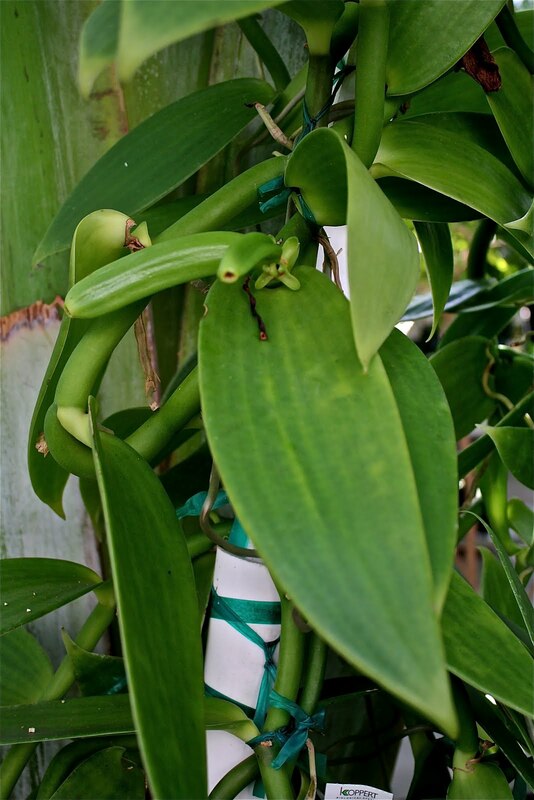 It's great for the visitor to get all questions answered and great for the plant collection that visitors don't get a chance to pinch a vanilla pod in passing. Above, pods ripening on the vanilla bean vine (Vanilla fragrans) that reaches almost to the top of the greenhouse. The main section of the greenhouse contains the tropicals. I saw many varieties new to me, like this great white bird of paradise (Streletzia augusta); I've only ever seen the orange one in the florist trade. 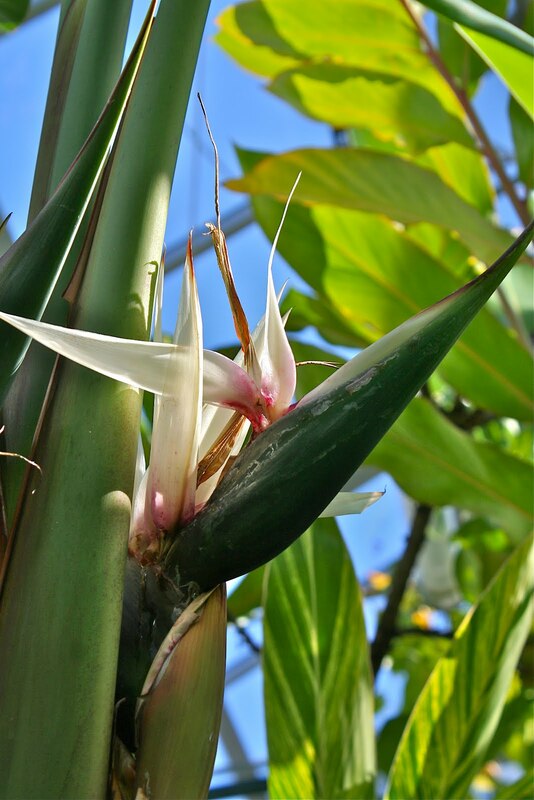 The greenhouse hosts tours from schools in the neighborhood, and of course kids are fascinated by the food plants, like sugar cane, coffee bean and vanilla. But they also gravitate toward plants that DO something, like the sensitive plant whose leaves curl up at a touch, or the carniverous pitcher plant (Nepenthes alata) that collects water and insects in its vessels and 'eats' them. their crimes, but no judge of plants, she was concerned that this Ruscus had bugs, until Ms. Bucharowski assured us they were only the flower buds, and what looks like leaf is really the stem. Above, plants that require a dry atmosphere have a room of their own, as do plants for special research. So go to learn, go with your kids, grand kids, or BFF's. 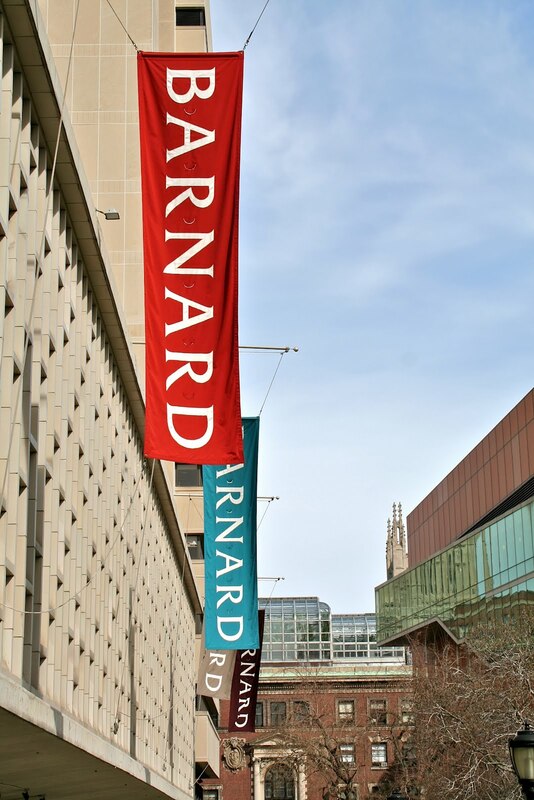 To arrange a group tour or to make sure the greenhouse isn't closed for school break, contact Kbucharo@barnard.edu, 212-854-5897. It's nice to know that there is always room for continual surprise and awe in this field. That's on my list of favorite things about gardening. Happy early spring to you. Hi ...I am food blogger and working on a project with edible flowers. Need to know if you know where I can buy zucchini flowers in May and all other varieties of ebibles.